A Digital Copywriter is a salesperson using a keyboard. Computer or smartphone keyboard. He creates words to sell. So, Copywriting is not art or humor to entertain. Copywriting can use art or humor to sell. However, that is not necessary. That is not the purpose of copywriting. Some festival of advertising judge advertising and copywriting by creativity criteria. That is not the essence of copywriting and advertising. Good copywriting is to sell. If simple words sell better than beautiful words, use simple words. If beautiful words make people remember and want to buy, no problem to use the word for copywriting. How copywriters do their job? He do their job by understanding target market, then create suitable copywriting for them. To do the job, copywriting must to get attention, communicate, persuade. Human attention span is shorter than before. So many marketers compete to get target market attentions in digital media. Promotion cost by using email is cheap. Meanwhile, people attention is scare. Therefore, market use spam filter in email. They also label interruption promotion as spam. 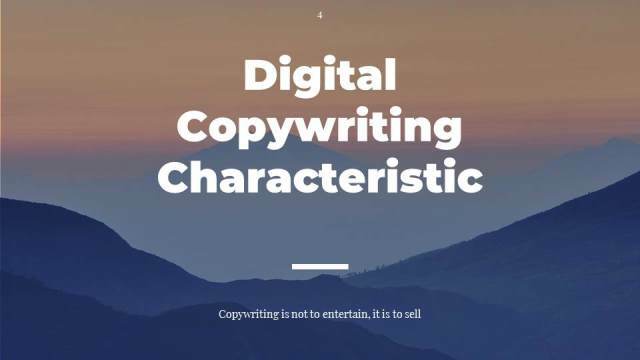 To face that challenge, digital copywriting has several specific character. The copy has to easy for short attention reader. it usually a brief copywriting for that purpose. It is also relevant for need, want and expect of the target market. The copywriting is also winning their attention and interest. Without their attention, copywriting is useless.